RhiannonBlog, it matches my Twitter and I couldn't think of anything else more imaginative! It pretty much does what it says on the tin. 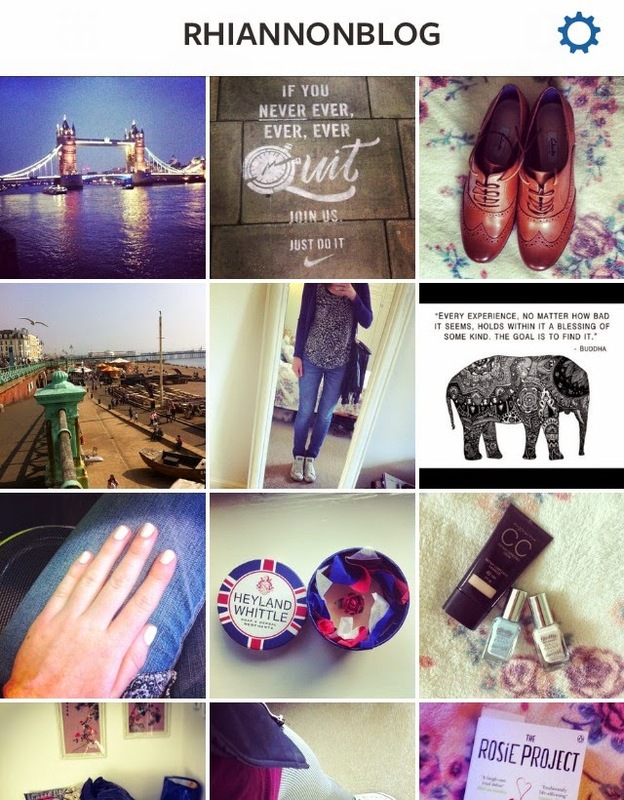 Plus 'Everything But The Kitchen Sink' is a pretty long name for both Twitter and Instagram! 137. Mainly fashion and beauty brands, magazines and bloggers, who I tend to lust over their perfectly positioned photos with an all white background! 71. I don't really look at the numbers too much, even if one person likes it then that's enough for me! Probably my most used are #OOTD #fbloggers #London #Brighton because I like sharing my daily outfits and any cool images I get when travelling to either city. Definitely fashion or OOTD style posts! Even though I totally fail at taking them myself (I can never find the right angle/light) I do enjoy scrolling through and seeing what all the fashion bloggers are wearing. Really depends on what I'm doing that day and what I see. If I'm super busy and just flat-out from work, then I probably won't post, but I try to post at least one a day! I switch between 'Rise' and 'Earlybird' they're both very light and flattering. 'Earlybird' adds a vintage-feel to images, whereas 'Rise' is a white spotlight, great for OOTD. Definitely a smartphone purist, I don't know any other way of posting an image?! @alexsteinherr - she's the Beauty Director at Glamour and has the most beautiful pictures of beauty products to lust over! @whitneyeveport - famous for The Hills and The City, Whitney has her own clothing range and it. is. just. so. cool. I tag Jessica Laura Chaitra and Kate! P.S Gotta mention the amazing @randomturtle account just for the laughs. Seriously, go look at it.